← Is Success Really All About Your Name? My favorite way to wake up this week…. …snuggled under a big pile of blankets, a soft meow summoned me from my dreams and I cracked my eyes open. The sun snuck in gently through the wooden blinds in the bedroom. Warm light grazed my cheeks and my kitten Maverick snuggled up against my neck meowing—right before his sand paper tongue licked my face. I laughed. The babes hadn’t stirred, and I stretched my arms overhead, hands into fists blinking up at the fan. The movement was hypnotizing, until the smell of coffee snuck up my nose. I am ready for today, I thought. I threw the covers off my bed, grabbed the kitten, and walked at a snail’s pace to the kitchen ready for a nice steaming cup of Joe. No, I don’t live in the mountains, nor do I live on the beach, but I do live on the outskirts of a pretty line of trees. It’s home. I’m happy. I’ll take it, and I’ve learned through the years, one way to get in a really great mood, is to wake up exactly the way you want to wake up. Today, I’m thinking about how we can set ourselves up for happy and the little things we can do to start our days off with a bit of a smile—even through the stress and the busyness that some days feels like a heavy coat around our shoulders on a 90 degree afternoon. I admit, I haven’t always consciously tried to make my mornings full of smiles—but I do know, now that I’m doing it, I find myself smiling and spreading a little more of that energy throughout my day. And I also believe, some days, it gives me the strength I need to switch on that positive light, and keep it burning as long as I can. So what do I do? What did I find on my search to wake up and feel ready for my day? I clean up the kitchen and spray my favorite cleaner all over the counters. I set the coffee to go off the next morning at 4:30 a.m. because there is something about a cup of coffee that stirs my brain. Smells really work for me. My favorite candles, my favorite cleaner. Even a dryer sheet mixed in with the laundry shifts my mood when I’m folding the clothes. I love to look at pinterest before I go to bed. Really pretty pictures. I dream. I sigh when I see one. I let my mind go for a moment. I’ve also found a huge joy in connecting with my facebook family and saying goodnight. I give good night kisses and hugs to the family. Listening. Watching those I care about light up when they know they have my full attention by stopping what I’m doing and turning to face them. It makes their day complete, which contributes to a bit of happy for me. Some nights, I don’t give myself an option. I’ve been thinking lately, even when I screw up, tomorrow I won’t have the same challenge. Tomorrow will be a new day. And when I stare at an impossibly busy week, I know without a doubt, there will be an end to the week. This thought has gotten me through the messes, consoled me when I’ve needed it—plus, I have some really great friends and family who I talk to, and they help me let go, too. It’s true, I’m not happy every day, but I can contribute and laugh and make myself smile and try to be that way. I want to be that way, and that thought might be part of a little morning happy, too. What about you? 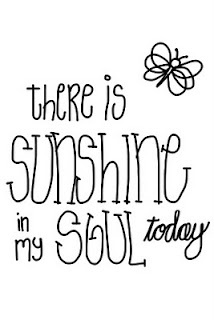 What little things in your life make you smile and lift your spirits? 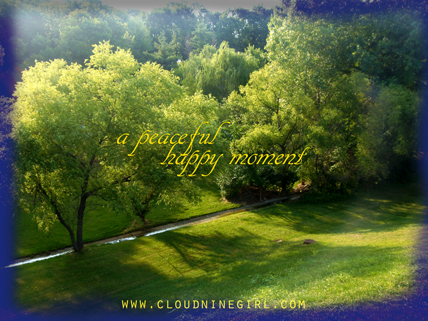 Posted on August 2, 2013, in cloud 9, cloud nine girl, Erika Beebe, looking for happiness, waking up happy. Bookmark the permalink. 4 Comments. You are so right my friend. Beautiful words and what a blessed grateful heart you have. Speaking of family, I hope you are all well, including your sweet new little gift. 🙂 I'm so glad you are back!